The Vivo NEX S comes loaded with a Snapdragon 845 SoC, NEX A with a Snapdragon 710 SoC. The Vivo NEX S (left) and NEX A (right). After a lot of leaks and rumours, Vivo has finally launched the flagship NEX S smartphone along with the equally good-looking NEX A. This allowed Vivo’s APEX concept to become a reality. The NEX S and NEX A come with pop-up selfie cameras hence giving the display an impressive 91.24 percent screen-to-body ratio. Both handsets don’t feature the notch that’s prevalent on most of the current flagship handsets. Vivo has termed this display’s feature as an Ultra FullView Display and they use 6.59-inch AMOLED panels sporting a resolution of 2316 x 1080 pixels with a ratio of 19.3:9. What’s interesting about the NEX S is that it comes with an under-display fingerprint sensor that is claimed to be 10 percent faster with 50 percent improved accuracy. The handset features a 2.2GHz octa-core Snapdragon 845 SoC, 8GB RAM, and up to 256GB inbuilt storage. The NEX A comes loaded Snapdragon 710 SoC, 6GB of RAM and 128GB inbuilt storage. Unlike the Vivo NEX S, the NEX A comes with a fingerprint sensor at the back and not in the display. Vivo has fitted a dual-camera setup on the rear of the NEX S. The primary sensor is 12MP with f.8 and the secondary one is 5MP with f/2.4. The pop-up selfies camera is 8MP. The NEX S is fuelled by a 4000mAh battery. It can be charged with the 22.5W charger that comes bundled with it. It runs on Android 8.1 Oreo and features Vivo’s FunTouch OS 4.0 along with AI enhancements. The handset is fitted with either 128GB or 256GB of onboard storage. Connectivity options for the NEX S include 4G LTE, dual-band Wi-Fi, Bluetooth 5.0, USB 2.0 port, and OTG (on-the-go) support. The Vivo NEX A has almost matching features as the NEX S. This phone runs on Android 8.1 Oreo and FunTouch OS 4.0. Unlike the NEX S which is powered by a Snapdragon 845 processor, this model comes with Snapdragon 710 and 6 GB of RAM along with 128GB of inbuilt storage. The cameras here are identical to the NEX S.
The Vivo NEX S is priced at 4,498 Yuan which is approximately Rs 47,300 for the 128GB and 4,998 Yuan which is about Rs 52,000 for the 256GB. 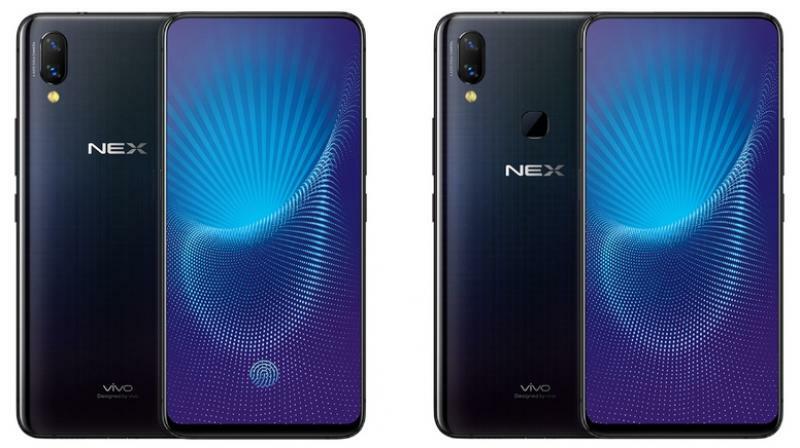 The Vivo NEX A is priced at 3,898 Yuan which makes it approximately Rs 41,000.